Picture this. It’s a Sunday afternoon and you have yet another summer barbecue. July 4th. Your friend’s kid’s 1st birthday. Your cousin’s neighbor’s graduation. Your parents complained they haven’t seen you all summer, even though it’s only July 5th. Your buddy bought too much beer (?) and needs help getting rid of it. The Red Sox are playing the Yankees. Again. Yes, I know. It’s tough having so many commitments. It’s sweltering hot, but feels nothing like the tropics, save for one dish amidst all the all mayonnaise-laden, indistinctly-seasoned bowls of pasta and potatoes. There’s a stray bowl of vegetables that seems like a good choice in theory, but one bite proves it was ruined with an abundance of… is that more mayonnaise? Didn’t your neighbor/aunt/boss serve the exact same dishes yesterday/last weekend/last summer? How is it that everyone you know that you thought didn’t know each other is in cahoots over menu planning? They’re all… out to get you. It hurts. I know. I’m sorry. But as I was saying, there’s one saving grace. A dish so colorful and mind-blowingly delicious that has everyone asking, “Honey, did you try the sweet potato salad? You’re gonna love it!” Snicker. And, “This is why it’s so hard to keep my girlish figure in the summer. All these parties with so much good food. Ugh (as they go for more).” Snicker. You know the truth, of course, and decide to make it known, because while it’s fun to keep everyone in the dark, it’s more fun to see their reaction when the facts are revealed. Sweet potatoes? phooey. So five years ago. They’re all well and good and surely most people nowadays get that they’re more nutritious than a regular potato, but really? They’re still rather calorie-dense. Butternut squash is where it’s at. Lower in calories* and just as creamy, sweet, nutty, delicious. Like butternut squash fries are just as good better than sweet potato, butternut squash salads make everyone think they’re eating the most delicious sweet potatoes ever. And when you tell them it’s butternut squash, I guarantee you’ll get all kinds of ego-stroking along the lines of, “Butternut squash? Really? I never would have thought of that. You’re so smart! You should do this for a living!” You won’t need to pat yourself on the back. They’ll do it for you. I guess they only teach butter and cream in culinary school? Oh, and mayonnaise. Who could forget that. Preheat oven to 375ºF. Spray a rimmed baking sheet with cooking spray and arrange the squash in an even layer. Spray the squash with more cooking spray. Roast for 40-50 minutes, turning occasionally with a spatula, until the squash is fork-tender and caramelized in spots. Remove from oven and allow to cool completely. Meanwhile, place the coconut in a dry skillet over medium-low heat, and cook for about 5 minute, stirring often, until lightly browned and fragrant. Immediately remove from heat and allow to cool. Transfer the squash to a large bowl and add the pepper, scallions, pineapple tidbits, and toasted coconut. In a smaller bowl, whisk together the yogurt, pineapple juice, lime juice, chili powder, cumin, salt and pepper. Pour over the squash mixture in the large bowl and gently stir until thoroughly combined. Fold in the cilantro, and chill until ready to serve. * Don’t believe me about the calories? 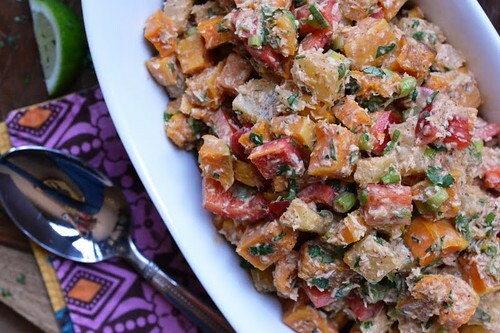 You can certainly make this salad with sweet potato instead of butternut squash if you wish, but it will have 55 more calories (that’s 42%) per serving. I don’t know about you, but I like to maximize my consumption. The more low-calorie, clean, awesome-tasting foods I can stuff my face with, the better. I know that you mean a 20oz can of pineapple, but some people may think you really meant 20 cans. 🙂 Might want to correct that! When I think of butternut squash, I think of all of these spicy, heavy fall dishes and never consider it for the summer. You have totally changed my mind – beautiful! It looks delicious! interesting… i never would have thought about squash and pineapple! I really enjoy making greek yogurt-based spreads and sauces these days. So much healthier! Cara, I love your creative recipes! I think I will make this side for an upcoming barbeque, maybe even the 4th. This looks amazing! you can get some very good ones, yes! Very interesting salad. I love the combination here. OH MY GOSH! i love the sound of this! the combo of flavors and pineapple, greek yogurt…jut delicious!!! I can imagine this tastes fantastic because I love pairing tropical flavors with sweet potatoes so I bet they work quite well with squash as well. Nom nom! Um yeah. The pictures are KNOCKING MY SOCKS OFF. Sorry I never responded to your last email! I'll get on it tonight 🙂 But really…they look amazing.And this salad. it's like you know the way to my heart. And my thighs. (But not really my thighs because this is just so damn good for me.) And my summer bbq menu. he he..I love your dish here, fetching color on it. This looks amazing. 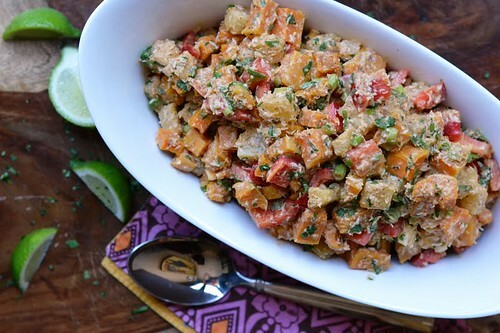 I've been wanting to make a healthy potato type salad and this looks like it might just fit the bill. I'm almost at a loss for words. Please, just get me a shovel and a bib. Glad to have that effect 🙂 Hope you like it! Thanks! I eat squash and pumpkin year round pretty much. It's really a muchmore versatile veggie than people think! Brillian, as usual. I have a kabocha. You think it would be ok with that? Cause I also have some frozen cubed butternut I could use too. I think I shall be making this over the weekend. Sorry meant to say BrillianT. omg, perfect! Im heading out to visit my hubs family for fourth of July and I gotta arm myself with some healthy picnic recipes. Pinning this one so I can bring it with me…Not only does it sound delicious but looks so pretty too! Who can resist a dish full of bright colors? I cant…I eat with my eyes alot. I might have to make this and save it for myself. Hope your having a fantastic weekend hon! You're freakin' genius. If I weren't heading out of the country for 2 weeks, I would be making this NOW! We eat butternut squash year round, in fact I think my daughter eats more butternut squash than any other vegetable combined and naturally I am always looking for new ways to use it. Thank you for sharing this delicious recipe. this is the most unique potluck salad i've ever seen, and i fully intend to take it to my next event. excellent creation! Great post! This sounds so good, I would definitely make this for a BBQ, or for myself. I think I'll make for my little trip next weekend! Pingback: Spanish Green Bean and Lima Bean Stew | the taste space - steam, bake, boil, shake!